Jonathan Gold’s food writing is so impressive that the former L.A. Weekly and current L.A. Times critic even won a Pulitzer Prize for his work in 2007. 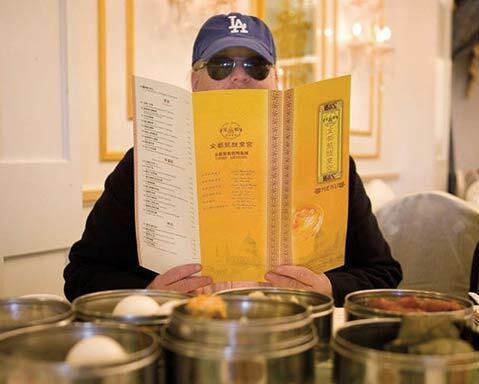 This intimate documentary explores the daily life of Gold, whose articles, though ostensibly about food, weave together the various histories, cultures, memories, and experiences that make Los Angeles such a fascinatingly diverse metropolis. How did you learn about Jonathan Gold? I moved to Los Angeles in the ‘90s to go to graduate school. I was reluctant to move to L.A. because of I held a lot of the judgements a lot of people hold about LA: the sprawl, lack of culture, etc., etc. I started to read Jonathan Gold, and his writing changed the way I saw and experienced the city. Was he welcome to the idea of a documentary? Cut to 15 years later, our kids ended up at the same elementary school. I took him out for coffee and pitched him on the idea. He said absolutely no and had several reasons: he wouldn’t let me film him reviewing restaurants and he wouldn’t give me any personal conflict. We had a few more coffee dates and he finally came around. I convinced him it would be a film that celebrated the diversity of L.A. and explored the city through his eyes. I wasn’t interested in making a traditional portrait documentary and that he reassured him. How much did you know about him before you embarked on this journey? I knew very little about him before I embarked on making the film. One of thing things I discovered that we explore in the film is the incredible rigor, research, and time he spends on each review. I became very interested in what the role of the critic is in society, especially in the age of Yelp and reader reviews on Amazon. I was happy to see/hear that so much of his amazing prose made it to the screen. Was that a goal of the film, to preserve his written work on screen? Yes, absolutely. That was very important to me. He is a wonderful writer. His writing transcends food writing. He’s a writer of culture and a writer of urban life. One of the toughest things about making the film was the challenge of how do you dramatize or make his writing cinematic. I wanted to capture the feeling of discovery you have when you read his reviews. I had always found his writing so moving and I credit his writing with making me fall in love with L.A. Many Angelenos feel this way about him — natives and transplants alike. I wanted the film to capture his love for L.A. If Gold opened a restaurant, what do you think he would serve? I think it would depend on the day you asked him. My next film is about another cultural figure in L.A., a person who makes you see the city differently, someone who debunks the many stereotypes of L.A.